The poll was conducted by two research organizations — FM3, which works with Democratic politicians, and New Bridge Strategy, which works with Republicans. The surveyors conducted 3,200 cell phone and landline calls with 400 registered voters in each of eight states: Arizona, Colorado, Idaho, Montana, Nevada, New Mexico, Utah and Wyoming. The poll showed that across the region, when asked whether protecting sources for clean water and recreation should be a priority and when asked whether protecting sources for domestic energy, oil and gas should be prioritized, 65 percent of respondents agreed with the first statement supporting clean water and recreation compared with 24 percent who supported oil and gas development. What is more, Western voters are willing to put their money where their ideals are: 68 percent of respondents across the region said they support a small increase in local taxes in order to protect water and conserve habitat in their local area. The percentage willing to pay more taxes does fluctuate across party lines, however. Democrats are more likely to support a tax increase, but even 53 percent of Western Republicans said they supported it for the purpose of local conservation. It isn't all that surprising that there is such an imbalance between public sentiment and public policy. There is a disproportionate amount of money and time spent assuring that public policy is created by those who support industry, even when communities and individuals suffer unpleasant consequences. Until campaign reform and the displacement of "Money-as-God" are effectively attained, it will not change. Sadly, I think you are right. But perhaps it can be moderated with pressure from the electorate. Just do a "show page source" and you can read the entire article. In the meantime the various definitions of “Medicare for All” and the pros and cons of each will get a thorough hearing, thus leading to a well-vetted solution after 2020.
said that Democrats would be allies to the insurance industry in the fight against single-payer health care. Just one note. There's only one version of Medicare for all, and it's encapsulated here, in the bill sponsored by Sanders. There are other ideas about making coverage more "affordable" or more widely available, or attempting to reduce costs in the existing system, but they aren't that. All that's fine, and there will, as you say, be a debate about different approaches to healthcare. Medicare for all, however, is a single payer system with private insurance pretty much out of the picture. It's also true, as you demonstrate, that a lot of folks will co-opt the term for their own ends, even though their policies provide something (sometimes substantially) different. I can live with "co-opt"ing the term if it gets us closer to "pure" Medicare for All via Public Option, Early Buy-in, etc. Private insurance will have a place for boutique services. I like my Medicare Advantage through Kaiser extremely well. There are multiple approaches. One summary of the various Democratic proposals is at VOX: We read Democrats’ 8 plans for universal health care. Here’s how they work. 3 of these 8 are "Medicare for All" . Others of them fit into your "something different" category. Thanks for the link, John. Good info there. So, there are two "Medicare for All" bills shown there. Sanders' and the House counterpart to that, HR 676, identified as Jayapal's bill, although originally sponsored by John Conyers. Both include this prohibition: "It is unlawful for a private health insurer to sell health insurance coverage that duplicates the benefits provided under this Act." The other concept, which is not a bill, is not called "Medicare for All" because it creates an entirely new program called "Medicare Extra." In other words, exactly the sort of co-option I'm talking about, especially when you look at how it's structured. I don't agree with Pseudo's claim that there is only one version of MFA. Sanders' version is a marker not the "one true version". We all know that the specifics of the bill will be modified, and that the devil is in the details. The Vox articles are extremely good. They describe a range of possibilities. The one I support is "MFA that leaves in place employer insurance." (Covers the 52% of Americans who don't receive employer insurance). I don't support "MFA replacing employer insurance" because it would be a huge disruption to the 48%. I'm confident that MFA + Employer Insurance, would evolve towards MFA 100%. Medicare for All is a good slogan. In the most generic sense it means universal health insurance. Let's start there and make sure that such legislation is both sufficient and viable, even if it isn't perfect. Let's call it the promise of creeping socialism. There's only one plan that takes a program, universal medicare, and covers all people. Everything else is a set of approaches, opt-ins, copays, deductibles, percentage outlays based on income, etc. That's all good, and it will all be debated, but folks are equating universal healthcare and MFA, and that just ain't true. I know that's not to a lot of peoples' advantage, because they want their plan to be the hot new thing, but it's all designed to co-opt the clear message of the left, that something for all should be a single payer system, free at the point of use for everyone. Period. Well, the single payer model you describe may be pure, but are you sure it is implemented anywhere? Canada's system is generally perceived to be single payer (thus reviled by the GOP), but is it really? I included this in my last post. " It is unlawful for a private health insurer to sell health insurance coverage that duplicates the benefits provided under this Act." Anything not covered is open for private insurers under the plan I support, just like in Canada. I never described my system as “pure;” you're putting words in my mouth. I think Canada's national plan under-covers folks, because I think teeth and glasses and prescriptions are basic healthcare, but that's a fine debate to have. BTW, other countries solve the problem of universal healthcare without single payer. Also an option to discuss. Also not what Medicare for All is. Officials at SKDKnickerbocker, a progressive public affairs and consulting firm, have been reaching out to Democratic operatives in the last week expressing fear the animus directed at Schultz over his proposed independent presidential bid was having a spillover effect on the coffee conglomerate he used to lead. Our boss decided to do something – but <snif> it should not affect our business , or ya know our lives. Tell it to the a**holes who ran Sears into the ground and then pillaged the bk. Tell it to the boards who blew up the pensions at United Airlines and hundreds of other companies where the C level staff did fine but everyone else got screwed. Howard Schultz is about Howard Schultz. Sure, he had a business idea and executed it amazingly well. And he adopted more than his share of progressive ideas for treating his employees. But, he is still a billionaire (+$3.4B and counting) who thinks that because he's rich, and it wasn't inherited, that he has a right. I don't want him to be president and so I prefer he not run. But he can do what he wants- and if anyonth thinks that his actions have no impact on his company or coworkers – well, that's not how it works. Oh, look! Tanc is spotted at the border with an august crew of #MAGA greats. I must admit, their commitment to hempcrete to build the glorious wall gave me pause. 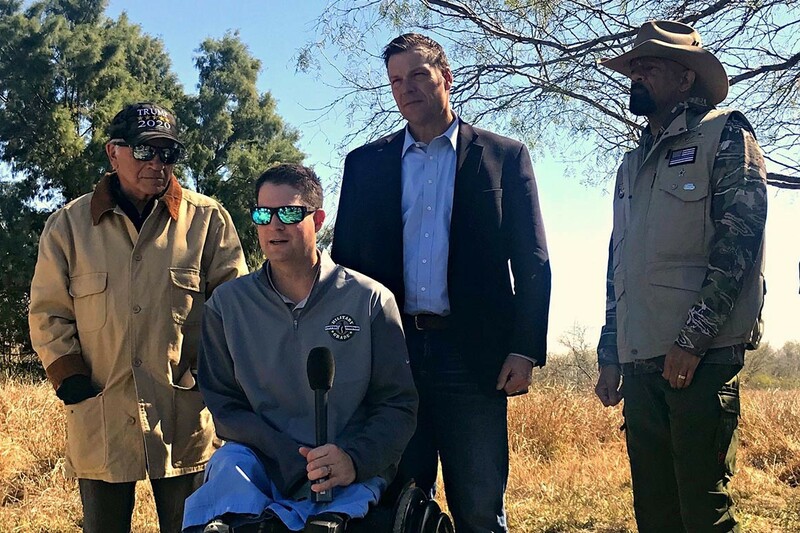 In what amounted to a kind of MAGA field trip, former Trump strategist Steve Bannon, former Kansas secretary of state Kris Kobach, former Colorado Rep. Tom Tancredo, baseball legend Curt Schilling, and former Sheriff David Clarke convened to discuss a new plan for building a wall along the southern U.S. border. Blackwater founder Erik Prince phoned in from South Africa. Don’t they look so completely under siege???!! They’re missing their King, Steve. Is he in a bunker in DC plotting something glorious for tonight’s circus? "Colorado runner chokes 80-pound mountain lion to death"
This is the most Colorado headline ever. I have a lot of respect for anyone who can fight off a wild predator and then drive himself to the hospital.